This outstanding volume is well-known for its simplicity, inclusiveness, and integrity to the fundamentals of the art of singing. The late Royal Stanton--an experienced teacher; the founder of Schola Cantorum, a symphonic choir of 150 voices; and a composer and arranger of many nationally published pieces--wrote with the flair to engage and hold the interest of newcomers venturing into the organized process of singing. His nine-step format provides readers the opportunity to build on their voice-training achievements. Singing is more than endless exercises and technical devices, and Stanton's methods have proven effective in guiding beginners from their initial tentative approaches to phonation, to the outer edges of performance and the rudiments of interpretation. Learning the joys of controlled singing in a friendly environment encourages beginners to think of singing as a natural, peer-approved activity. 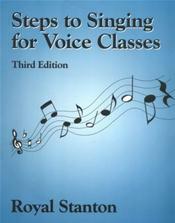 Outstanding features: 1) forty-three songs provide many opportunities for singing and practice; 2) valuable exercises and activities can be tailored to a variety of learning situations; 3) logical organization, beginning with critical breathing techniques; 4) useful as is or in conjunction with other materials; and 5) actively involves readers in every aspect of the learning process.